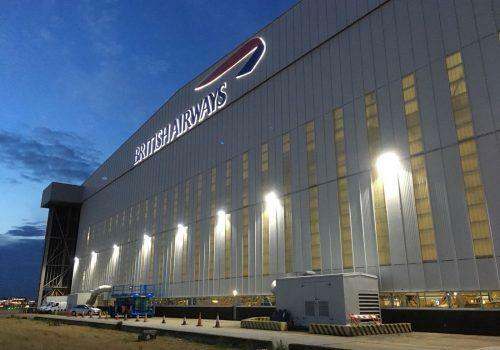 Premier Technical Services Group PLC’s (PTSG) Building Access Specialists division has recently completed a significant contract to install signage for British Airways at Heathrow Airport. British Airways, part of International Airlines Group, is one of the world’s leading global premium airlines and the largest international carrier in the UK. The airline is due to celebrate its 100th anniversary on 25 August 2019. The Group’s expert engineers visited the site to install new signage to the façade of Terminal 5. The sign was custom built and installed on site by the Group’s qualified engineers and is now visible to passengers both taking off and landing at Heathrow Airport. PTSG’s skilled engineers use a wide range of access equipment to install signage at height. Rope access techniques offer a quick and economical solution to erecting signage, with minimal disruption in comparison to other methods such as scaffolding; a necessity for busy and prestigious clients such as British Airways.